Profile of Jagadindra Mondal ..
Jagadindra Mondal was born on 1st March, 1933 at Gangutia, in Manikganj, now in Bangaldesh. His school education was completed at Mrityunjoy School of Mymensingh now in Bangladesh.His college education was from City College and Vidyasagar College, Calcutta. All his Post-Graduate education ,i.e. M.Sc(Psychology),M.A. (Philosophy), and Ph.D were from the University of Calcutta...Prof. Jagadindra Mondal is now professionally serving as a psychologist / psychological counsellor. Still now he has been serving the department of Applied Psychology, University of Calcutta as an expert member of the P.G Bored of Studies in Applied Psycology. He served Rama Krishna Mission Sikshana Mandir, Belur Math, Howrah , as a lecturer in Psychology for about six years. Then he served as an Assistant professor of Psychology at the Government Post-Graduate Teachers' Training College, Hoogly for about three years. After that he joined the Department of Applied Psychology, University of Calcutta .where he served for about twenty five years, first as a Lecturer, then Reader and then as Professor and Head of the Department. He was also the Dean .Post-Graduate studies in Science of the University of Calcutta for two years (1993-1995). Being invited by the West Virginia University,U.S.A. he visited the university for delivering lectures on Substance abuse and Rehabilitation Psychology at the Department of Psychology in 1996. The West Verginia University honoured Professor Mondal .Dean of Science .University of Calcutta in recognition of his outstanding contribution to Applied Psychology and Rehabilitation , He was also presented with an award of Distinction by US-Asia Foundation for his leadershp in promoting Rehabilitation Psychology in Calcutta University. At present he has been serving as an expert external member of the post-graduate department of P.G. Board Of Studies of Bethun College , Calcutta. He has been serving as the President of the Governing Body of Vivekananda Primary Teacher's Training College, Narendrapur, Station Road, Calcutta - 700 150. He published a good number of research papers in reputed National and International Journals of Psychology .He authored books on Mental Hygiene, Philosophy and Principles of education. History of Psychology, Dreams and Mind, Life and contribution of eminent Psychologist in Bengali and Books in English titled (1) Mental health, mental disorders and Psychotherapy"(2) "Dreams: Mirror of the Mind". He is a member of the Editorial Board of a reputed Research journal "Disabilities and Impairments ".published from Delhi .He is still now an expert member of the Faculty Council of the Post-Graduate studies in Science .Calcutta University and a member of the Senate .Calcutta University. He is a life member and ex-Eastern Zone Persident of the Indian Academy of Applied Psychology. As a Poet he started writing at the age of sixteen in the then reputed literary journal 'Mandira' and earned second prize in Inter-Collegiate poetry writing Competition in 1950 .In 1956 ,he started editing a poetry journal 'Mayukh' for about ten years in two phases( 1956-1961) and (1990-1995),which earned great appreciation. Poet's Foundation, a forum of National and International Poet's Recognized by UNESCO has selected Jagadindra Mondal as the President of Poet's Foundation situated in Calcutta Recently. written bwtween 1955 and 1990. Then published three books "Bilin Roder Din", ' Bat ,Jhuri. Siker'... and 'Adrshya'...'Jagindra Mondaler Sreshtha Kabita'. Recently in 2018 Kabita Samagrya, Jagindra Mondal has been published by Abong Mushara, another book containing valuable discussions on Poetry & Litarature has been published, The name of the book is 'Kabita Niya Bhavna O Koiekjon Kabi'. He was awarded "Kiran-Smriti purashkar for his talent in Poetry and music by Rabibasar , an old literary organisation of great repute, graced by the presence and guidance of Rabindranath Tagore, Sarat Chandra Chattopadhay, Bibhuti Busan Bandhopadhya. Premendra Mitra, Tara Sankar Bandhopadhya and recently by Dr.Pratap Chandra Chandra & Dr. Sushil Mukherjee. 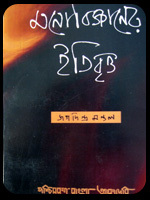 His latest prose book on poetry (2011) titled "KABITA NIA BHABNA O KAEKJAN KABI". As a singer he has earned wide appreciation as published in different reputed News Papers and Literary journals. His first disc on Rabindra Sangeet came out in 1984, being approved by the Jhiu music Band of Viswa Bharati, Santineketan. After that a number of cassets & C.Ds on Rabindra Sangeet & Atul Prasad's songs came out. His last CD of Rabindra Sangeet came out in 2016. On 22nd November 2017 Poet's Foundation Organised a solo programme of Rabindra Sangeet of Jagadindra Mondal at ICCR Hall, Calcutta ( Satyajit Ray Auditorium, Hochimin Sarani Calcutta ) and earned great appriciation on his performance which was reflected different Reputated Newspapers and Journals. His 20 Songs sung in the occassion was restored in You Tube by the organizer for circulation to reach greater audiance.